The Pack for a Purpose project was an initiative of Mr. Jem Winston, whom I must say is an excellent collaborator with the Grand Fond Primary School. This project is growing by leaps and bounds and has become a household name at our school. For the past three years, Pack for a Purpose has evolved from guests at Three Rivers taking small packages to Cruise Tourists taking bigger packages. We really appreciate these supplies, thanks to the tremendous efforts of all the stakeholders and the kind contributors. You have helped us to make school a rewarding place for our students. They are happy to know that when they work hard, rewards are available to them. Furthermore, their teachers have more resources to teach them, thus resulting in better academic achievements for the school. The Pack for a Purpose project came in at the right time for the right school, and we feel highly privileged. For the past two years, we have shared our resources with at least three schools, always hoping that we will receive even as we extend a hand to others. 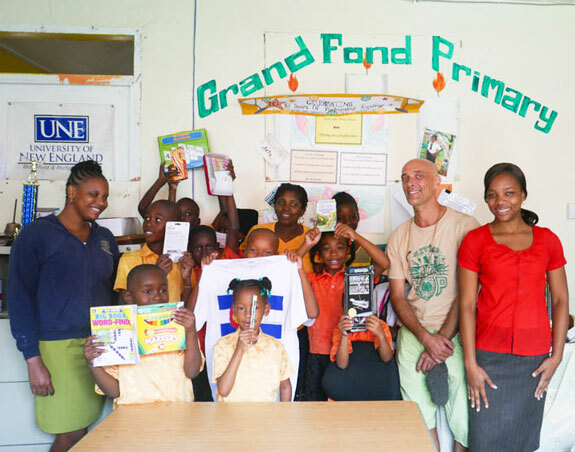 The Grand Primary School is grateful to Mr. Jem Winston and all the Pack for a Purpose travelers. Thank you! Thank you! Thank you!